My inner mama bear came out at the new park playground near my house last weekend. With claws out and teeth snarled, I was a sight to be seen. It’s incredible how quickly and naturally a mother’s instinct to protect her young springs into action. While climbing the stairs to the new toddler slide, a little girl blocked the way so my nearly two year-old couldn’t pass. When my sweet baby tried to get around her, the girl put her flattened hand straight on my daughter’s chest and shoved, pushing my daughter backwards off the steps, causing her to fall onto her back and head on the turf below. Completely rattled, I grabbed my baby and looked around for the pusher’s parents who were nowhere to be seen. Not wanting to leave the scene of the crime without making sure that this kid had proper supervision, I told the little girl “sweetie, we don’t use our hands to push.” Suddenly a woman was in my face, harshly telling me she saw the whole thing and that her daughter didn’t push mine. I begged to differ and told her so, to which she yelled at me and started to walk away. I wished her luck raising her daughter with such a skewed value set (okay, I might not have said it quite like that). Meanwhile, as my daughter cried on my shoulder I found my husband and older daughter by the swings and breathlessly recounted the entire story, holding back tears myself. Luckily, my daughter is fine aside from the emotional scar she is carrying with her as she continually repeats, “girl pushed me.” And, though I really wanted to give that mother a taste of her daughter’s own medicine, I took the high road and instead talked to my little one about being kind, even when others aren’t kind to us. She understands, as best as a two year-old can, that hands are not for hitting and that it’s important to treat people the way we want to be treated. As I’ve reflected on that moment over and over again for the last 48 hours, I’ve grappled with what else I could have done. Should I have been standing closer to my daughter on the steps and caught her before she fell? Probably. But, at the same time, I believe a little independence in a safe setting is an important stepping-stone in growing up. 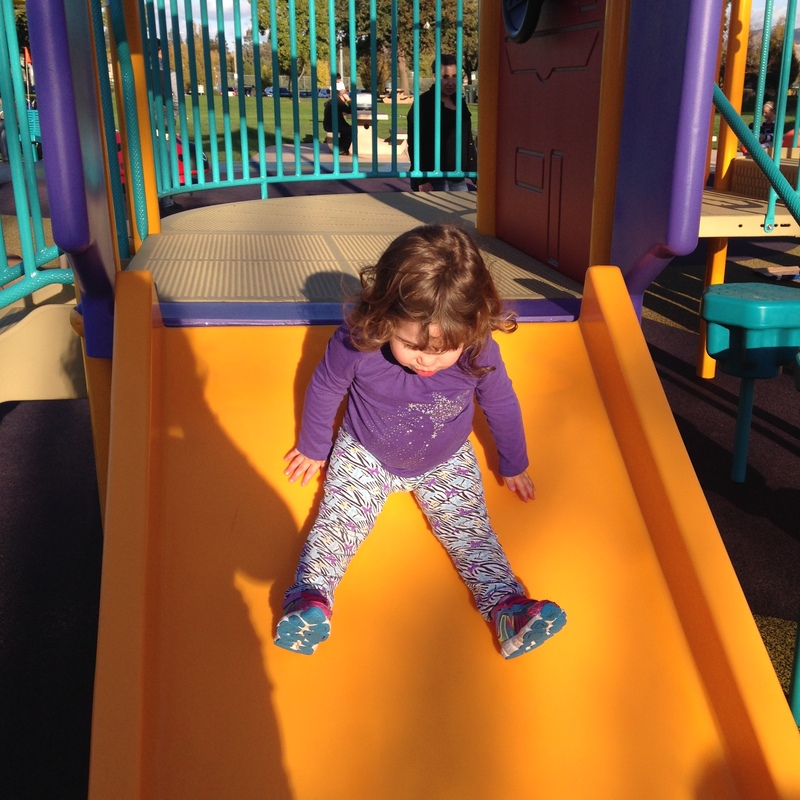 And, the three feet distance that I stood away from the stairs was enough for my daughter to feel accomplished in getting to the slide “all by myself!” while still keeping me engaged in her exploration. Should I have said nothing to the child instead of trying to use her action as a collective teachable moment? Probably. But, at the same time, don’t we all want our kids to grow up in a world where they are taught right from wrong, even if the lesson is coming from a source other than a parent? I do, but I guess that other mom would disagree. That moment on the playground shows me how important having a “village” is. My husband and I are blessed to have made a connection with a few other parents from our daycare, allowing us to spend time with the eight adults and seven kids with some interchangeable parenting. The kids listen to each of us. 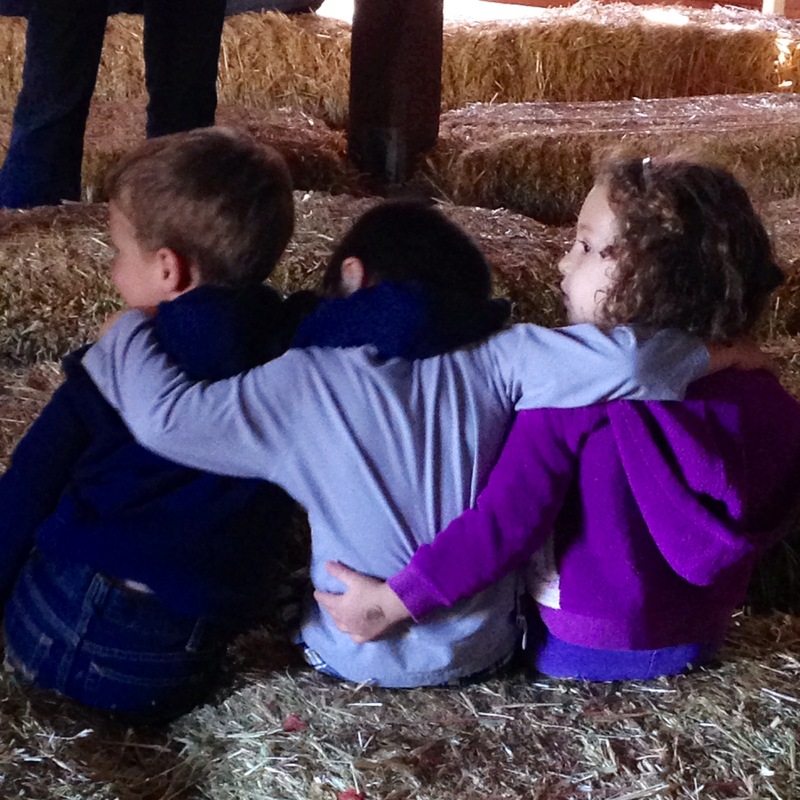 We are all comfortable with each other’s parenting style and trust each other to right one of our children’s wrongs. I took this for granted on the playground, assuming that this other mother would be appreciative of me using the altercation between our girls as a teachable moment. Or that she would have had the grace to apologize, or make her daughter apologize because it was the right thing to do. Or, would have even showed a shred of compassion to see if my daughter was okay. Even if her daughter hadn’t pushed her, she was still a culprit in the fall and could have been taught about empathy, grace and apologies. But this mother and daughter duo are not a part of my village, and apparently the parenting code of decency stopped there. As parents, it is our responsibility to equip our children with the tools and instill in our children the lessons necessary for making the world a better place. We need to teach our children to be kind people who will grow up to make a positive difference. A spat on the playground as toddlers evolves to bullying later on, and how we respond to it sets the tone now and in the future. There is nothing I can do to help that other mother see how deeply she missed the opportunity to role model good behavior to her daughter. But, I can teach my daughters to be caring individuals, and I can continue to role model what I believe to be the appropriate way to treat others, whether on the playground or otherwise. That’s my promise to them. Yes- your promise to your daughters and the role model that you are will prepare them for a world that is full of bullies, conflicts and ways to solve simple as well as complicated problems. Bravo. I had a moment last week with Bodhi, different situation but same reaction, and as I reflected it on it all weekend I realized how many more times this was going to happen in his life, so many times I won’t even know about and very few that I’ll be able to protect him from. All I can do is help build his own resilience and skill set so he can protect himself both physically and emotionally. Then I cried because I realized that this mommy business is tough and that I’ve got to build my own emotional skill set so I don’t freak out on everyone who hurts my boy. Kelly – I think of this often and haven’t even yet been confronted with this type of situation. Thank you for sharing. You are awesome. Eloquent as always; so sorry this happened wish every playground was also a village.